There are many new research paths to explore and some are already advanced enough to be used. 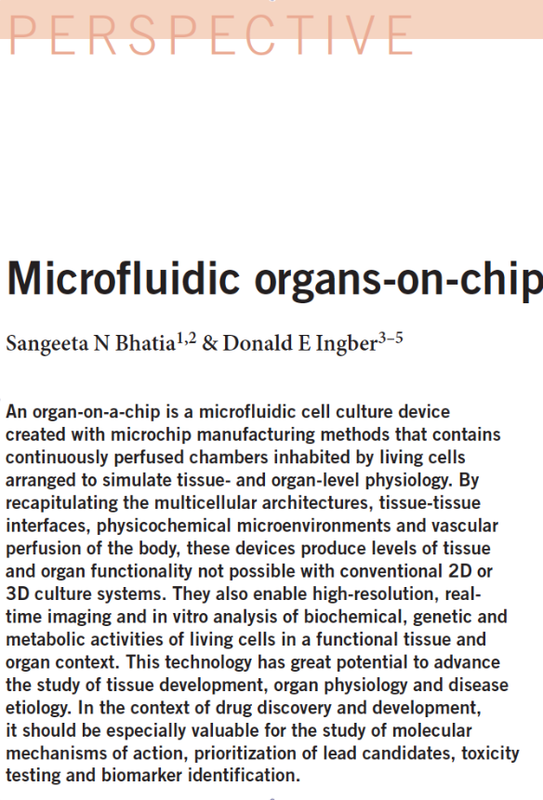 Work on Human Organs-on-Chips as replacements for animal testing. We attach a very recent review in NATURE BIOTECHNOLOGY (click here to read the study) that provides an up to date summary of the status of this field and references all of our own publications. ProAnima: Professeur Jean-François Narbonne you’re a biologist and a well-known toxicologist. After much reflection and experimentation you have agreed to become the scientific expert for the Valitox® test of acute toxicity in human cells. Your decision has been motivated by the innovative scientific potential of Valitox®. Developed by the Novaleads laboratory, financed by major Swiss and French animal welfare associations, *(1) and coordinated by Pro Anima, Valitox® presently offers excellent predictivity. Furthermore you’ve decided to include it as part of your in vitro test protocol under the name Cytox, aimed specifically at the oyster farming industry. Can you tell us about progress with the test? Following up on the latest articles, first in Nature then in Le Monde and most recently in your interview for Sud ouest, how soon can we expect to see lab-mice replaced by Valitox® and the proposed in vitro methods? Valitox®, is a biochemical test for acute toxicity in culture-grown human cells and it does indeed have excellent predictivity for acute toxicity in humans – 82% compared with 65% for the mouse test! It could well be a good candidate to replace live lab mice in toxicological research with mollusks. Compared with existing in vitro techniques, Valitox® allows us to move towards high volume routine procedures. Its other plus point is that its marking technique can be adapted to other types of cell, human or animal. If we take an overview of the whole range of alternative methods, then no single test is going to replace animal testing. It’s a question on the one hand of using whole batteries of in vitro tests to detect variations in reactions such as genotoxicity or reprotoxicity, and on the other hand of reflecting such results in computer models. Coming back to the Programme National Arcachon (PNA) for shellfish farming, that aims to develop alternative methods for researching phycotoxins, three of the known toxins were tested using Valitox® on two series of human cells; intestinal cells and liver cells. The results suggest good predictivity for the test. Furthermore there’s a good correlation between the results obtained with Valitox® and those obtained more specific tests such as the COMETES test. Those are the results we presented at the Rome congress. In the third phase of the programme we’ll be comparing the ability of the different tests to detect the toxicity of oyster extracts that have led to the death of mice. (1) To evaluate the quantity of toxins present as a result of what was called biological dosing, in the absence of chemical dosing techniques (at the time biological dosing was used for pesticides, for hormones and for vitamins); and to serve as a biological test when the chemical dose was unknown. (2) To provide dosing of the toxin and to alert you to the presence of unknown toxins. Today we know how to detect and quantify mixed toxins using chemical techniques and we no longer need the mouse as a unit of biological dosage. On the other hand we still need biological tests to spot undetected dangers, which is also why we need to have alternative tests available. ProAnima: Given these very positive results, when can we expect in vitro techniques like Valitox® to be recognized as acceptable alternative methods? Prof. JFN: In France everything is more complicated. The corporations and their lobbying of government organizations are influential and powerful. It’s above all a matter of politics. In contrast with the USA, where the validation of alternative tests is done by an inter-agency committee, in France everything is centralized through the INERIS *(2) which hogs 80% of the public budget for test validation, whereas its constitution is that of an EPIC (definition? - http://epic.iarc.fr/about.php) according to which the tests ought to be financed by the industry. INERIS thus has a statutory conflict of interest. I think that its only by regrouping the start-ups, bringing together the computer modelling and the biological cellular tests via a large international grouping, that we’ll be able to speed up the validations. Research takes a long time and it costs a lot, as do validations. We’re critically short of funds even though our techniques are ready to be applied. We should note, too, that some tests have been in use for years even though they have never been validated, for example tests for reprotoxicity or genotoxicity have been on the market for ten years! ProAnima: Pro Anima, thanks to the SNDA*(3) and the SPA, found the wherewithal to participate at the world congress on alternative methods in Rome, and you yourself are just back from the ECVAM Congress in Rome. Could you please tell us about that congress on alternatives to animal experimentation, and sum up its main themes and objectives? Prof. JFN: There were more than 800 people at the ECVAM world congress *(4). It was huge and an opportunity to make extremely interesting contacts because each country sent several scientists. France was conspicuous by its absence! Only the Oréal group turned up to defend our corner! Christopher Furger, R&D chief at the Novaleads laboratories presented a paper on Valitox® that was of interest to the Oréal researchers, as well as to other researchers we ought to meet next October. We’re planning to include Valitox® in a special catalogue bringing together in vitro and computer model approaches developed by different European start-ups who specialize in these new techniques. The Spanish have done something similar bringing together different regions such as Catalonia, Andalucia and Galicia, which are very active in this sort of research. The idea is to create an entry portal, a single catalogue for the industrialists who have to apply the REACH Directive. Valitox® will obviously be prominent in this catalogue. Ideally, we should be able to propose techniques to the industry on a turn-key basis. In Rome the problematic REACH*(5) was debated at length. As the recent article in Nature has emphasized, subsequently published in the general press, notably Le Monde, 143,000 molecules have been pre-registered compared with 100,000 anticipated, and 68,000 of those molecules need to be subjected to toxicological testing, not the 30,000 envisaged at the outset, about double what was anticipated! This of course doubles the cost of testing; in the absence of validated alternative methods it will take about 56,000,000 rats! But at least REACH has confronted the industry with its responsibilities, and we’re pleased that economic considerations are now aligned with ethical ones. ProAnima: How can we resolve the equation? Will we finally witness the establishment of truly European political will? Prof. JFN: The EU makes the laws but its true that we’ve done everything back-to-front and not very rationally, unlike the USA: In Europe it was said that all chemical substances entering the human environment need to be tested, and that’s a strong social demand. But we never asked the fundamental corollary question of how to go about doing the tests? With a legislator’s mindset, unfamiliar with toxicology, it seemed to be just a matter of applying the protocols used for evaluating medicines, pesticides or food additives . . . just like any commercial chemical substance. But those protocols are mainly based on live animal testing. The toxicologists immediately understood the impossibility of such a task, but they were accused by some NGOs of abetting the chemical industry’s foot dragging in implementing the Directive. Today we can see that the application of traditional protocols is impossible and we can’t figure out how to test all the substances! In America, on the other hand, they first invested millions of dollars in developing alternative test methods (Toxicology in the 21st Century) before promulgating a law on the evaluation of chemical substances, which seems more logical! Nevertheless in Europe there is a practical obligation to validate alternative protocols and they ought to be paid for by the industrialists who need them. The EU has just released 25 million Euros via the ECHA (European Chemical Agency) matched by another 25 million from l’Oréal. A two-pronged and urgent willingness is evident. The top priority now is for high volume tests that are simple, rapid, viable and applicable to any chemical product. Valitox® certainly responds to those criteria. ECHA*(8) in Helsinki is coordinating national agencies in the registration of substances in the context of REACH. In France, AFFSSET*(7) is the principal interface for the ECHA, and has just incorporated the BRPC, that was originally part of INERIS. ProAnima: What in your view are the most promising directions for research? Prof. JFN: High-volume techniques. We’ve gone from the test-tube to the high output silo which is now very high (1500), and we’ll soon be using robotics that will allow parallel testing for a variety of outcomes (e.g. reprotoxicity, carcinogenicity, apoptosis, oxidative stress) on ten cell types with 15 doses for each substance, whereas with animal testing we had to test a single molecule at a time. The Read Across technique, allowing us to see the mechanism of a molecule’s action by putting it alongside another, is now becoming generalized and will corroborate data already acquired, avoiding the animal massacre outlined in Le Monde . . . we must be able to offer different turnkey programmes, both computer models and in vitro, right up to ‘-omic’ techniques – genomic, proteomic, metabolomic. ProAnima: Quite. What should we be thinking about the new techniques of proteogenomics and toxicogenomics? Prof. JFN: These are complementary and very interesting techniques, but they need about ten more years of research. ProAnima: Are the toxicologists getting on with the in vitro work? Prof. JFN: There aren’t many toxicologists in France, because so many toxicology labs have been closed. After twenty years of running down toxicology in universities and research institutes there’s been some attempt to rebuild toxicological centres, often quite artificially as in the case of the Rovaltin project. In these centres there’s a lot of work on cellular cultures, but they still use animal testing. ProAnima: To conclude, what are your next objectives, what are your hopes for the development and validation of protocols for alternatives to animal testing? Prof. JFN: Private benefactors have an important role to play in rolling back political obstacles in France. For once, private money is important and it’s not just a question of propping up chums, but of relevant and important scientific research. Even a small amount of money can be a tipping point to move research forward and shift habits. Surrounding ourselves with a number of independent experts, and with a minimum of essential funding, we’ll have what’s needed. We’ve got the know-how. The validation process will accelerate because there is demand across Europe. The support of animal welfare organizations, notably for Valitox®, is important in the development of ethical research that is relevant to humans. ProAnima: Thank you, professor! You give us more than just hope, a direction for our public health objectives for the benefit of all: humans, nature and animals! 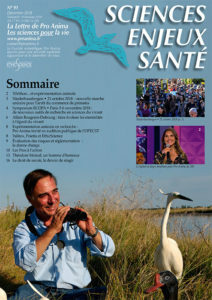 *(1) The main partners of Valitox® are the following associations: Bourdon, Ligue Suisse contre la Vivisection : LSCV, la Ligue Française contre la Vivisection : LFCV, la SPA Nationale, la Société Nationale de Défense des Animaux. *(3), The Fondations Brigitte Bardot et Trente Millions d’Amis. *(5) REACH : Registration, Evaluation, Authorization, of Chemical products. *(6) OECD Organisation for Economic Cooperation and Development. *(8) ECHA : European Agency for Chemical Porducts..
* JACVAM : Japonese Agency for Validation of Alternative Methods. * ICCVAM : Interagency Coordinating Committee on the Validation of Alternative Methods. * In silico: Term used to describe computer modeling of chemical processes. * Read Across : Classification of substances based on their behaviour, allowing in part to use the toxicological findings for an substance already tested to inform the findings of a new substance, which reduces the number of tests needed (and the number of animals used). * Reprotoxicity: Effect on the reproductive processes, positive response to some tests. * Genotoxicity: alteration of genetic make-up, positive response to some tests. * High-volume tests : Acceleration of in vitro tests allowing synchronus multiple measures. Increases in output from the 10ml test tube to the glass or plastic micro silo with 96 compartments of just 350 µl. Next was a silo of 384 compartments of 140 µl, and now we’re using silos of 1536 compartments of 10 µl. This can only be achieved, of course with a high degree of robotics and test indicators consistent with such high outputs (for example the Valitox® test indicator is based on fluorescence). To save time one can also study several doses of a product on several types of cell, and on several toxic effects, but all at a cost. That effectively overcomes one of the main criticisms of classic in vitro tests, that they are generally concerned only with a single type of cell and a single function. *”omic” techniques: techniques born of modern biology as a result of tools that allow study at a molecular level of the response of genes (genomic), of proteins (proteomic), and of the metabolism (metabolomic). *Apoptose: process to induce the programmed death of a cell (involved in the mechanisms of carcinogens). * BRPC : Office for the evaluation of risks from chemical products and agents.